We’d love your help. 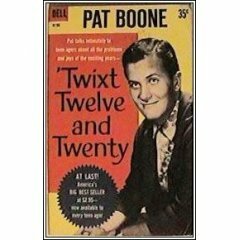 Let us know what’s wrong with this preview of Twixt Twelve and Twenty by Pat Boone. To ask other readers questions about Twixt Twelve and Twenty, please sign up. I give this book 5 stars simply because it is so CHEESETASTIC! I collect books for teens and preteens from the 1930s-1960s. Advice books on dating and hygiene are my favorite! I also love pulp novels of all kinds and chapter books like Cherry Ames and Sue Barton books. So this book is a true find for me. I love it. I love to pick it up and hold it, feel it's tiny weight, look at the 1950s graphics, and read the achingly horrendous "advice" that good ole Pat give to "the teen-age" about dating and I give this book 5 stars simply because it is so CHEESETASTIC! So this book is a true find for me. I love it. I love to pick it up and hold it, feel it's tiny weight, look at the 1950s graphics, and read the achingly horrendous "advice" that good ole Pat give to "the teen-age" about dating and love. You cannot read a paragraph of this book without busting out into laughter. The best part -- it's not a comedy! He was serious. Some agent got him this deal, some manager told him he could make money on it, some ghostwriter interviewed him and wrote this up, got paid and did not get a credit. And some people actually bought it! Pat Boone actually had enough fans to make producing this book worthwhile. Some people possibly read it! This book was actually published in 1958. I read it shortly thereafter. At a time the second most popular male singer in America (behind Elvis), Boone never forgot his roots or his faith. This autobiography describes growing up in a family hurt badly by the Depression. I assume Boone had help writing it, though I don't remember any credit given. Well conceived and told. I had a really hard time selecting a shelf for this one ~ considered making up a whole new category, because it really does stand alone from all other books. It's hard to believe anyone took this book seriously. Gives a lot of hilarious insight into Pat Boone as he gives advice to teens about life and love. It's so difficult to sum up all of the cheese in this book with a short review. For example, Boone writes of when he first began to consider his highschool "steady" as wife material. He began I had a really hard time selecting a shelf for this one ~ considered making up a whole new category, because it really does stand alone from all other books. It's hard to believe anyone took this book seriously. Gives a lot of hilarious insight into Pat Boone as he gives advice to teens about life and love. It's so difficult to sum up all of the cheese in this book with a short review. For example, Boone writes of when he first began to consider his highschool "steady" as wife material. He began seeing her as, "not merely someone to kiss under a full moon but to love and cherish even with a runny nose." He also admits to his mom bending him over the bathtub & spanking him when he was seventeen!! Why does Pat Boone feel it necessary to give advice to teenagers??? Eat dessert first, Pat said to!